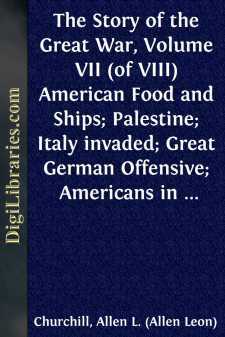 The Story of the Great War, Volume VII (of VIII) American Food and Ships; Palestine; Italy invaded; Great German Offensive; Americans in Picardy; Americans on the Marne; Foch's Counteroffensive. On August 1, 1917, the second day of the Franco-British offensive in Flanders, Field Marshal Haig's troops delivered a counterattack at a late hour of the night against the Germans north of Frezenberg, and close to the Ypres-Roulers railway. The assault, made through heavy rain that transformed the battle field into a morass, was a complete success, the British winning back lost ground on a front of 300 yards, which Prince Rupprecht had captured in a dashing attack a few hours before. At every point in this sector the British succeeded in driving out the enemy and completely reestablished their former lines. In the morning and again in the afternoon of August 2, 1917, persistent and violent efforts were made by the Germans to win back lost territory to the east of Ypres. In spite of heavy losses they continued to attack at short intervals British positions from the Ypres-Roulers railway to St. Julien. Every assault was shattered by the British artillery barrage or the concentrated rifle fire of the British infantry. Although the constant falling rain made observation difficult the British aviators continued active. When not scouting for the infantry they carried out daring attacks on the German aerodromes and on transport and infantry bodies with bombs and machine-gun fire. Few German machines ventured above the lines in the unfavorable weather. The British airmen brought down six machines and lost three. The number of German prisoners captured in this sector had now risen to 6,122, of whom 132 were officers. The captured material included eight field guns, fifty-three machine guns and thirty-two mortars. The territory about the Ypres salient showed the devastating character of the British fire. In many places the German dead lay in piles, and from their position it was evident that they were in the act of falling back when struck down. Many had fallen victims to their own artillery, when the German gunners in frenzied efforts to stem the onslaught of the Entente troops dropped shells among their own men. East and southeast of Rheims the Germans attempted two surprise attacks on the French positions in the night of August 1, 1917, which were crushed. On the left bank of the Meuse there was violent artillery action, the Germans renewing their attacks at 9 o'clock in the evening in the sector of Avocourt Wood. The assaults failed, and cost the Germans heavy losses. In the same region in the Apremont Forest, southeast of St. Mihiel, attempts made to surprise the French met with disaster. August 3, 1917, the British continued to regain ground lost to the Germans earlier in the week. They established themselves again in St. Julien. North of the Ypres-Roulers railway large bodies of Germans massing for a fresh attack were scattered by the well-directed fire of British guns and were unable to deliver the assault. In the course of the day (August 3) the British drove out the Germans from most of the positions they had gained during the previous night east of Monchy-le-Preux, and in a determined push won considerable ground south of Hollebeke.